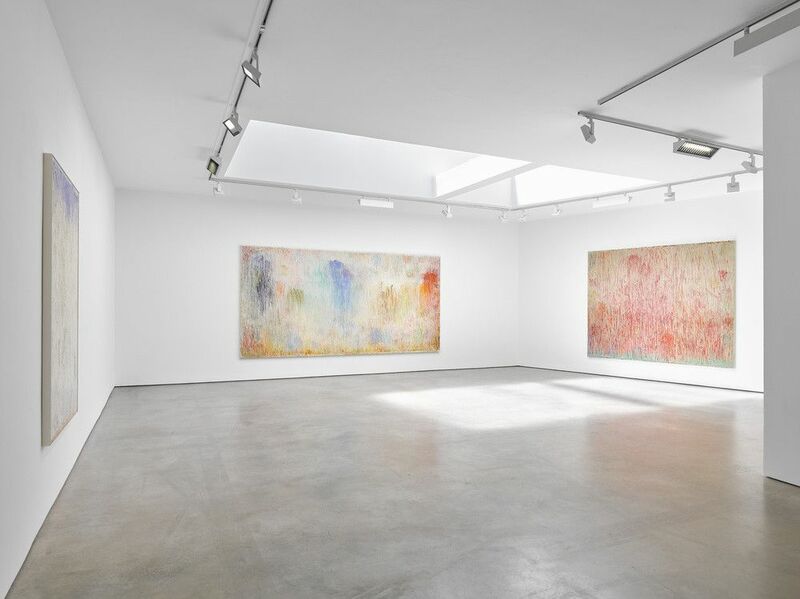 Christopher Le Brun’s first exhibition with Lisson Gallery features a new series of abstractions created over the past two years, culminating in a number of large-scale paintings, some light in touch and some involving dense accretions of colour and gesture. These works represent a singularly rich moment in his 40-year career. Le Brun has been a celebrated British artist since the early 1980s; he has also been an instrumental public figure in his role since 2011 as President of the Royal Academy of Arts in London, which celebrates its 250th anniversary this year. The glowing, scintillating surfaces of Le Brun’s recent oil works on canvas – containing passages of pure painting that could be described as both luminous and numinous – are what he describes as “primary, non-ironic” responses to the act of painting, rather than self-reflexive commentaries on the process itself or homages to previous artists. There are, however, notable references to music and literature, including one composition entitled Concert (2017), which seems to bring many strands and motifs from his current bodies of work together as one, as if Le Brun was corralling every note from the orchestra towards a climactic, harmonic blast. Poetic references are often found in the titles and works in this exhibition. For example, The King’s Highway (2017) takes a line from Geoffrey Hill’s poem, 'The Jumping Boy' (2006) – “He is at home on the king’s highway” – to describe Le Brun’s commitment to his profession as a painter above all else. However, influences from Le Brun’s drawing and printmaking practices also surface throughout this new work; especially in his decision to draw directly onto many of the surfaces with the paint tubes themselves or to move pigment around with a palette knife. This allows the tube nozzle or pointed blade to scarify the surface, performing a kind of sgrafitto (scratching to reveal the layer below) or intaglio (cutting or engraving into an image), which invoke techniques derived from sculpture and printmaking. Each line or touch is but one in a procession and continuum of nudges and additions, produced over many months, that reveal the full scope of Le Brun’s experience and knowledge as an artist, perhaps recalling what the English writer Walter Pater wrote in 1869 on the work of Leonardo: “It is the landscape, not of dreams or of fancy, but of places far withdrawn and hours culled from a thousand with a miracle of finesse.”This sensation of continuous change and layering contributes to certain works approaching an ‘all-over’ field of paint, one that hangs in the balance between union and chaos, despite being carefully poised, both spatially and tonally. Le Brun occasionally permits a sliver of an edge, horizon line or border to interrupt the tumultuous interior, with his keen sense of colour also contributing to the constant exchanges of movement, energy, warmth and light occurring throughout this radiant show.